NYC, 02/27/2019, 6:30PM. 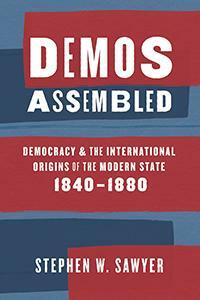 Demos Assembled: Democracy and the International Origins of the Modern State 1840-1880. Previous studies have covered in great detail how the modern state slowly emerged from the early Renaissance through the seventeenth century, but we know relatively little about the next great act: the birth and transformation of the modern democratic state. Demos Assembled (University of Chicago Press, 2018) provides a fresh, transatlantic understanding of that political order’s genesis, and sheds new light on the subsequent reciprocal influence that American thinkers and politicians had on the establishment of post-revolutionary regimes in France.